The range of interests and activities at Culzean provides a perfect day out for the family. Robert Adam's castle, built 1772-1790 for David, 10th Earl of Cassillis on a clifftop site associated with the Kennedy family since the late 14th century, is notable for the Oval Staircase and Circular saloon. The castle contains a good collection of pictures and 18th-century furniture, together with an armoury, set up in the 19th century. 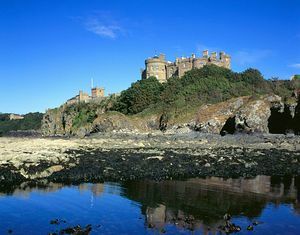 Culzean was Scotland's first Country Park, created in 1969 and consisting of 563 acres. There is a wealth of interest from shoreline through the Deer Park, Gas Court, Fountain Court and Swan Pond with exhibitions, to mature parklands and gardens. The Ruined Arch, Viaduct, Ice House, beautiful Camellia House and unique Pagoda have all been restored. 12 miles south of Ayr, on A719, 4 miles west of Maybole.